The Zambia National Students Union has called on all students in the country to avoid exposing themselves to political violence by wearing political party regalia. Commenting on the murder of a UNZA student who just graduated, Prince Ndoyi the ZANASU Vice President said the political violence in country has escalated to levels unseen before hence students should play what he termed as smart politics which will not expose them to the violence. Mr Ndoyi said the levels of desperation by political parties is worrying hence students should realise that cadres will do anything to try and win the elections. He said what is happening in the country is un-Zambian and that the police and other law enforcement agencies should ensure that the people behind the murder are brought to book. He said the student body in the county is saddened at the loss of a vibrant young person who could have contributed to the country’s development and his family’s well being. “These type of politics should have been long gone,and we call upon all intelligence wings to access the security situation in the country as we go to the polls and if it threatens the lives of the Zambians let us postpone the elections or else there will be no peace. We will not rest until the people are brought to book,” he said. Why do all political cadres look dirty and clueless? UPND, PF, FDD, MMD etc. If they only knew that they were sheep and goats. Just say don’t wear UPND party regalia as PF thugs will pounce on you. They can wear PF regalia and they will be safe but the moment they wear UPND, then they are taking a risk. Who is causing violence therefore? Actually noone in the entire country should be allowed to wear the political regalia at all. Lets get this sorted. This law passed be passed in parliament. I totally agree with you. Before the pamaka party (PF), there never used to be military like party regalia which is fueling violence. It should be law that no party should produce the regalia because voting is secret. UPND does not have instruments of power to stop violence. 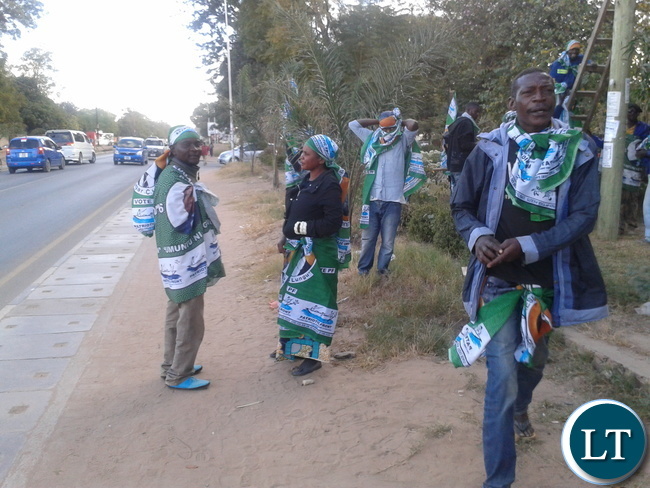 HH is on record to condemn violence whenever he addresses his supporters…he can only do so much….the PF has the big stick to cane anybody found wanting regardless of party affiliation…so PF use the big stick. Another possibility to explain the violence never seen before in Zambia can be attributed to the fact that a hungry man is an angry man..Govt has a responsibility to ensure the well being of the people they govern e feed them, make medication available to the sick, pay civil servants/students/contractors/govt suppliers, retirees etc on time..at the end of it all we are humiliating ourselves before thee entire world that we are an uncivilized country. Iwe chi ‘Kakolwe’, do you realise that the person (student) who died was wearing UPND regalia and killed by PF cadres. What do you mean by shame on you UPND? Fool. 2. Lungu is behind this violence. It is a shame that Zambians like you can go on social media supporting violence being perpetrated by pf cadres.I can’t believe that this is happening to our once peaceful nation. I hope that you sleep in peace and your relatives in Zambia are prospering and well protected.